Appeal For Courage has succesfully concluded! The transcript from the presentation ceremony is below. Sincere thanks to everyone who helped ensure the troop's voices were heard. This was a small, but important part of our victory in Iraq! Over 2,000 signatures were submitted to Congress in a ceremony presided over by Senator Lindsey Graham (R-SC), House Minority Leader Rep. John Boehner (R-OH) and VFW Executive Director Bob Wallace. Also attending were Senator Saxby Chambliss (R-GA), Senator Jim DeMint, House Chief Deputy Whip Representative Roy Blunt (R-MO), Republican Conference Chairman Representative Adam Putnam (R-FL), and Republican Chief Deputy Whip Representative Eric Cantor (R-VA). Director Bob Wallace: Welcome to the Veterans of Foreign Wars United States Washington office. And special welcome to the members of Congress who have joined us. forces today who have signed the Appeal for Courage petition that I will present in a few moments. women who have signed this petition to hand the petition to Senator Graham and Congressman Boehner. just to slow down and think, just for a moment, you have your view of the war. And this is democracy. time to figure out what America should do. America should support those in harm's way without condition. Senator Lindsey Graham: And now the Republican leader of the House, John Boehner. Representative John Boehner: Well, Lindsey, thanks. And thanks for including me in this. bill on the president's desk and really support our troops. Senator Lindsey Graham: Senator Chambliss? Senator Saxby Chambliss: Well, thank you. And thank you, Bob, for headlining this today. VFW does such a great job with all of our men and women, both active duty as well as retired. I just returned from my fifth trip to Iraq, Georgia's very proudly the home of the 3rd I.D., which is headquartered at Fort Stewart and at Fort Benning, Georgia. to get down to business on a funding measure that will help our troops. 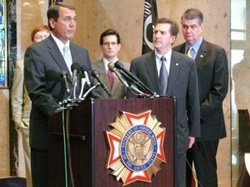 Senator Lindsey Graham: Senator DeMint? the talk of retreat emboldens their enemy. It makes their fight harder. And it endangers their lives.